Good News Sushi Fans! Atlanta has another fabulous option for sushi. And by "fabulous" what I mean is incredible-amazing-can't-wait-to-go-back kind of sushi. 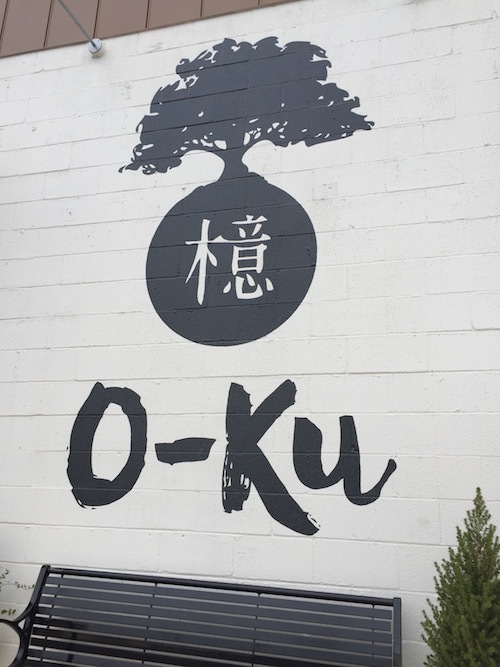 I love, love, love O-ku sushi. 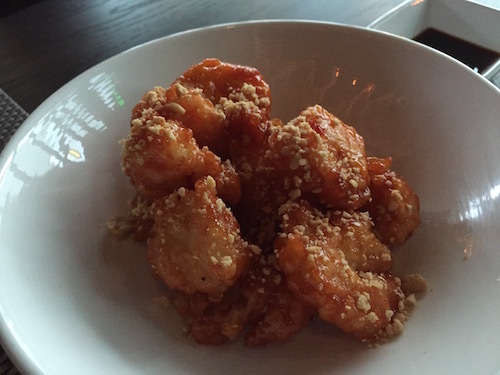 The mix of tomato confit, red chili and crushed peanuts were great pairings for these perfectly cooked shrimp. Nothing kills me faster than when restaurants overcook their shrimp. Happily, there were no such worries at O-ku. 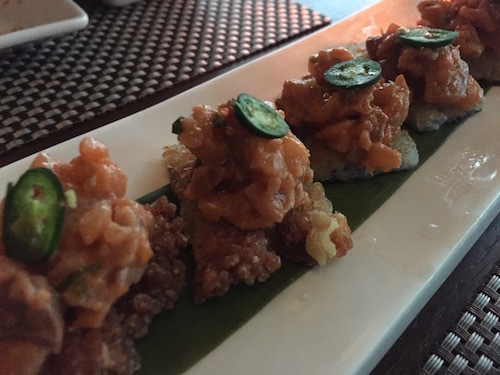 From the starter menu we also tried the spicy yellowtail on a rice crisp. Do you notice the jalapeño on top of each piece? Yeah...I had to pick those off. WAY too spicy for me, and I'm usually not one to shy away from heat. So, be warned.The chef's signature nigiri changes was definitely a menu highlight. The options change regularly so our selections may not be available, but definitely visit this section of the menu and note the creations are sold by the piece. Billy had the wagyu beef and I had the hiramasa which is lightly charred yellowtail. Speaking of yellowtail, the "Green Eggs and Hamachi" was not only creatively presented, but the pairing with spicy tuna, cucumber, and asparagus was delightful. Can't you just see the freshness? After all of those dishes we wanted one more order. The waiter steered us to a special from the "box style" section of the menu. This is sushi where the ingredients are stacked up on the rice as opposed to being rolled. I failed to write down the exact selection we made so I'm not much help in this category which is PARTICULARLY sad because this one was the favorite thing I ate all night! Doh!! I have failed you dear reader which, as penance is required, I will need to return to O-ku and do some further research. I promise to report back! Just in case you're there, here's a closeup...In all seriousness, O-ku's menu is vast and based on our limited exploration, I don't think you'll go wrong with any order. Let me know what you discover!